Players face several perils throughout the game of chula. In shapfour of the game played in Quark's Bar, Julian Bashir was singled out and "eliminated" by a burst of energy. Crew or Away Team member with total attributes closest to 22 (your choice if tie) returns to hand. To get past requires CUNNING > 24 remaining. Characteristics: "Chula" dilemma, wall dilemma. 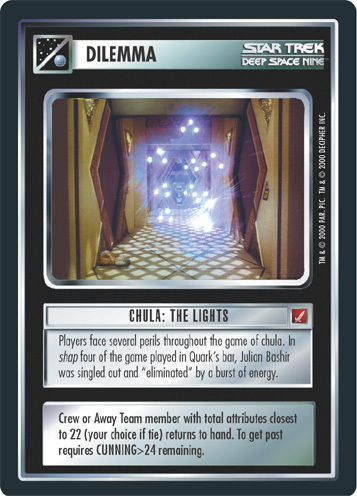 There are 15 entries for Chula: The Lights (ST1E 9 SAR 145) at the Tradeplace (17 haves and 5 wants). Click here to see all trade list entries for this Starter Alternate Image Reprint Card card!